I know that they aren’t actually snowflake Valentine’s, but that’s what my students are calling them. Aren’t they simply adorable? I love each and every one and I can’t wait to put them in the students’ scrapbooks. Right now they are decorating the walls coming into the school. Simply find round paper doilies, (I found mine at my local grocery store!) paint and some cute little hands. I backed mine on construction paper to make the pictures POP a little off of the walls. So cute!! I love hearing from kids about what 3 and 4 year olds love. The silly answers like, “my doggy”, “chocolate” or “playing at the park” make my heart smile. I use these simple journal printables to take a PEEK into their little brains and see what they are thinking. I made two versions depending on the writing skills of those that you work with. Download the printable FREEBIES below. Sometimes it is difficult for young ones to recognize patterns. You can use these printables to not only discuss different patterns on hearts, but also have children practice matching patterns on hearts. Print out the freebies below and use with the little ones in your care! I love a good old fashioned Bingo game and my students love it too!! What better time to play than Valentine’s Day? 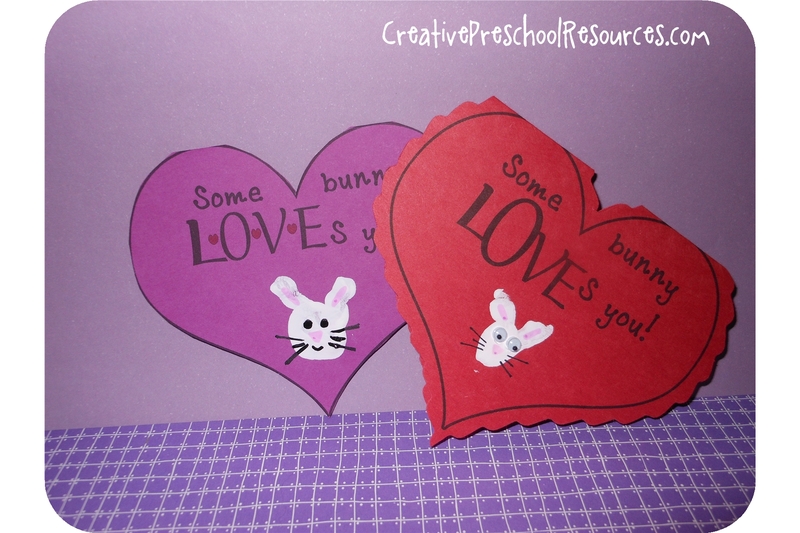 Here are a few printables to make your child’s Valentine’s Day special and full of fun. I like to let the kids mark the letters they have with candy hearts. YUMMY! Download the printables below. Valentine’s Day will be here before we know it! Here are some fun printables that I created last year for Valentine’s Day that you might enjoy with your little ones! Feel free to download and use as desired. I hope these come in handy with the upcoming Valentine holiday! Each year I make these stained glass hearts. They make the classroom look so festive! Here’s how I make them with my class! This is a Valentine’s card that kids can make! I love creating these with my Preschool cuties! Free Printable at bottom of page! Don’t you love cute things hanging from the ceiling? I do! I made some Valentine decorations that I just LOVE!!! I usually use paper lunch bags to decorate and collect Valentine cards in my preschool class. This year I wanted to do something different. I made these cute treat bags using felt and my sewing machine. Super simple, super cute. I love them, don’t you?